A gamer in a dispute with another player made a fake emergency call to Kansas police last week, which resulted in the killing of an unarmed man by police. Even more tragic, Andrew Finch, father of two, was not a gamer, and was not involved in the dispute. Police have arrested 25-year-old Tyler Raj Barriss, who has taken credit for calling in over 100 of these dangerous false alarms, known as swatting. 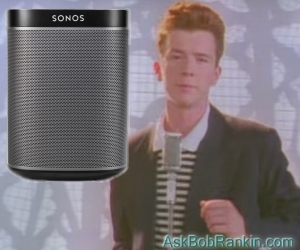 If you're hearing nothing but Rick Astley tunes on your expensive stereo, check your wireless settings. Certain Bose and Sonos Internet-connected speakers can be found and hacked remotely if their network settings are not set properly. The FCC has approved a new “charging at a distance” technology called WattUp that enables wireless charging of mobile devices’ batteries up to three feet away from the charger’s base station. "Your money's no good here." Some businesses are refusing to accept cash, insisting on plastic or mobile payments via Near Field Communications (NFC). “Video game disorder” is now officially recognized by the World Health Organization as a mental illness. Parents of teenagers have "recognized" this for decades. So when will the WHO recognize "smartphone addiction" as a mental problem too? A “Nigerian prince” scammer has been arrested in Slidell, LA. He’s not Nigerian or a prince. He’s a 67 year-old white guy named Michael Neu, who is now charged with wire fraud and money-laundering. Comcast is raising the price of 25 Mbps Internet-only service by $10 to $75/month in selected markets where consumers have no alternative broadband options. Some analysts blame the increase on the rapid rise of cord-cutting, with customers dropping phone and TV service. Forward your spam to sp@mnest.com and a bot will reply to the spammer for you. The bot will continue wasting the spammer’s time while you enjoy more cat videos. A consumer drone collided with an Army helicopter near Brooklyn’s Verrazano Bridge, putting a 1.5 inch dent in the chopper’s rotor. Drone owner Vyacheslav Tantashov is in a bit of trouble with the National Transportation Safety Board (NTSB). It’s not just you. Robocall spam increased massively in 2017; the FTC averaged 375,000 complaints about robocalls per month. A Pennsylvania ISP has warned its customers that if they are even suspected of downloading pirated content, their Internet speeds will be throttled and that may cause “issues” with smart-home appliances. Most recent comments on "Geekly Update - 03 January 2018"
The principal purpose of that statute is to ensure the nationwide acceptance of U.S. currency, consistent with constitutional language1 that reserves to Congress the power to create a uniform currency that holds the same value throughout the United States. While the statute provides that U.S. money is legal tender that may be accepted for the payment of debts, it does not require acceptance of cash payments, nor does it provide that restrictions cannot be imposed upon the acceptance of cash. If a merchant doesn't want my cash, it's obvious that he doesn't want my business. The NTSB is an investigatory body; it has no enforcement powers. Mr. Tantashov is in trouble with the Federal Aviation Administration. A business not accepting cash would simply not work here in the mid-west, where people still go out of their way to avoid use of credit cards, and ApplePay locations are rarely seen (or aren't working). If a business can freely decide to not accept my cash, then I can also freely decide to walk out the door with the goods I was trying to purchase. I would even say "thank you." Several years ago we had a severe derecho windstorm come through, which knocked out all power for a 60 mile radius. No power meant no open stores, no ATM's, no banks, no cell phone towers or battery chargers for days. Several gas stations ran their pumps with generators, and several groceries let a few customers in at a time with flashlights to purchase non-perishable items. But you could only pay with cash, and they didn't give change! You were elated to buy $15 in groceries and pay $20 with no change returned. For this reason, we now keep a cash reserve at home for these type of emergencies. Are we going cashless; I don't think so! It almost always trakes longer for a credit or debit card transaction to go through than to make change. This is just one more step towards cashierless stores. IMNSHO I choose to shop elsewhere. No cash accepted means no sale to mw. There are plenty of other stores, restaurants and fast food emporiums who will gladly accept my cash business. After all this time it's just amazing people still believe in that $50 million that Nigerian prince wants to give away. How do you protect such stupidity? A "No Cash, Credit or Debit Only" business wouldn't be possible where I live. 10-20% of the local population doesn't even have a bank account. So, I don't see that idea spreading far outside major metro areas. I'm finding since yesterday, that sites aren't linked until you click "I'm not a robot." I tried to sign in with Google+ for leaving a reply on one site, and it showed a screen of code. Or some say you have to complete the "Captcha" but there is not "Captcha" seen. PS: The + post was your article on spam the spammer, (today's). One of your most helpful and best! Tyler Raj Barriss needs to be locked up for a very long time with Rick Astley tunes piped into his cell 24x7. I read a few of the exchanges. Some pretty funny. I shop using credit cards almost exclusively as I pay off the statement balance in total every month and as a result I have no interest payment and no credit card fees, just cash back of $20.-$(? )+ monthly. I daily monitor the balance and pending charges. I don't use or want a debit card. I still have a liquid stash of coin and bills in house, well as the means to protect them. In the event of civil / government break down, (G forbid) I am prepared to survive. Are You? Thanks Bob for the spam link. It may come in handy to forward spammers. But now they have my email address. @RichF; Stupidity but mostly greed. My mother would not believe she was being scammed. Totally delusional she was. Police were called to the bank and she was ejected twice. They thought she was money laundering. She broke her ankle trying to mail a money order. Locked herself out of her car. Spent most of her money. Called us kids twice telling us the limo is on it's way and she was going to collect millions. I kept telling her you don't send money to win prizes. Scam. The difference in Tacotron 2 voices are detectable but pretty close. I have lived in many areas of the USA and can hear even a slight variance in perfect speech vs. human where subtle intonations from regional accents intrude. Bottom line is, who cares. A magnificent achievement by Google engineers. I even find Alexa on Amazon Echo pleasant. She never scolds. A Comcast sales person visited here 2 weeks ago. Assumed we ditched them for their high price. I had no complaint about their internet service otherwise. But the woman here is a diehard Verizon landline customer. And they couldn't touch my AT&T mifi monthly fee. We let the answer machine screen ALL calls. We know it's not a ROBOCALL when a rude caller pushes and holds a phone button sending an annoying hum to our phone. If caller id gives us a sender's number and they call often I block the number with Google Voice. A lot of times the spammer will continue calling with a different number.